Part 1 Basics of microjoining: Mechanisms of solid-state bonding; Mechanisms of soldering and brazing; Mechanisms of fusion microwelding; Modelling of solid-state bonding; Modelling of fusion microwelding; Sensing, monitoring and control; Assembly process automation and materials handling. Part 2 Microjoining and nanojoining processes: Microelectronics wire bonding; Solid-state diffusion bonding; Bonding using nanoparticles; Diffusion soldering and brazing; Laser soldering; Fluxless soldering; Laser microwelding; Electron beam microwelding; Resistance microwelding; Adhesive bonding; Introduction to nanojoining. Part 3 Microjoining of materials and applications of microjoining: Joining of high temperature superconductors; Joining of shape memory alloys; Wafer bonding; Plastics microwelding; Microjoining in medical components and devices; Hermetic sealing of solid oxide fuel cells; Joining of bulk nanostructured materials; Ceramic/metal bonding. Many important advances in technology have been associated with nanotechnology and the miniaturization of components, devices and systems. Microjoining has been closely associated with the evolution of microelectronic packaging, but actually covers a much broader area, and is essential for manufacturing many electronic, precision and medical products. Part one reviews the basics of microjoining, including solid-state bonding and fusion microwelding. Part two covers microjoining and nanojoining processes, such as bonding mechanisms and metallurgy, process development and optimization, thermal stresses and distortion, positioning and fixturing, sensing, and numerical modelling. Part three discusses microjoining of materials such as plastics, ceramics, metals and advanced materials such as shape memory alloys and nanomaterials. 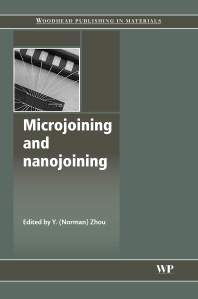 The book also discusses applications of microjoining such as joining superconductors, the manufacture of medical devices and the sealing of solid oxide fuel cells. This book provides a comprehensive overview of the fundamental aspects of microjoining processes and techniques. It is a valuable reference for production engineers, designers and researchers using or studying microjoining technologies in such industries as microelectronics and biomedical engineering.